To advertise it’s recycling chops, a Canadian home improvement company has cleverly recycled a giant Apple billboard in Montréal. 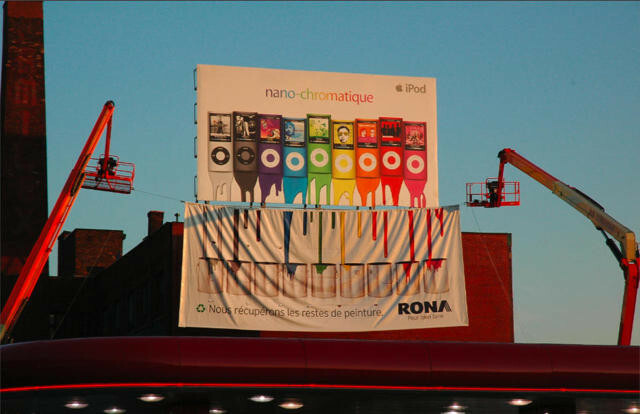 Canada’s version of Home Depot, Rona, hung a banner underneath an Apple billboard with a line of multicolored iPods dripping colored paint. Rona’s banner shows the paint being collected in paint buckets. The clever mashup advertises the company’s paint recycling program. Link to nice pictures at MacQuébec. Link to Cyberpresse report in French. Great read! I wish you could follow up on this topic..